My daughter helped me take the picture. She asked me what he had done. Awww don’t leave us hanging!! 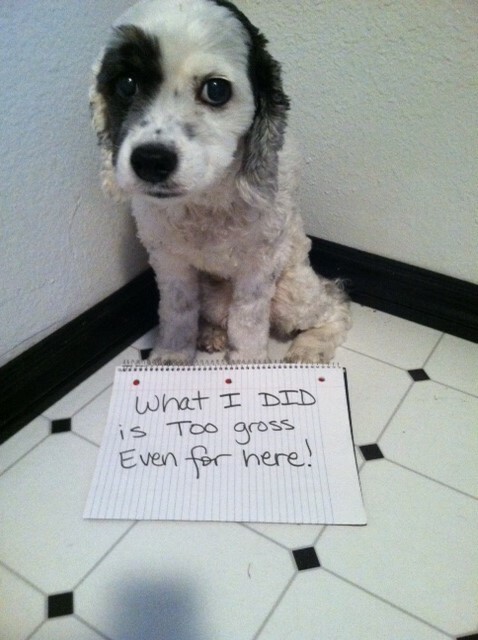 Very cute dog who is clearly ashamed, but my least favorite Dog Shaming ever. So what’s the point of submitting a pic? That’s like the Postsecret entries that are just ‘No-one wants to know my secret’ or words to that effect. Attention seeking, seems like. My dog ate a tampon. I didn’t know until I found it in the yard attached to some poop. Oh dear! I’m thinking that was the ‘crime’ here too. Poor guy does look suitably embarrassed. I had to pull a tampon out of my female Ridgebacks backside. agree! i want to know! What dog could eat a bear? If you were trying to keep from giving my dog ideas, it was probably a lost cause. Her grossness capability is rather broad. Think one of the grossest things any of our dogs has done is attempted to eat another one’s vomit. I have a dog that eats my daughter’s dirty disposable diapers out of the trash…. and drags the remainders of them throughout the house… that’s pretty gross. If the crime isn’t disclosed, the pic shouldn’t be posted. I agree! If the crime isn’t told, there’s no real shame. Shame on the person who posted this and did not give facts…and thanks to those who owned up to the gross laughs! I am going to guess this was a case of the one-dog canine centipede. That is: pooped, ate that, vomited, then ate that, then pooped again, then ate that, then vomited, etc. Asked my wife if she was feeling ok. She replied, “no, kind of an upset stomach. Oh? Kind of nauseous, you know, like that feeling you get when you see something gross? No, I reply, we have 5 dogs now and with the poop, vomit and, dead things they bring in and roll in that I end up cleaning up, I really don’t know that feeling anymore.